VolunteerHub streamlines volunteer management for you and simplifies the experience for your volunteers. Each touchpoint of our volunteer management software seamlessly guides the volunteer through the process before, during and after an event, so they’re more engaged in every opportunity. Volunteers can easily browse your calendar and access dedicated pages for each volunteer opportunity from their desktop or mobile device. 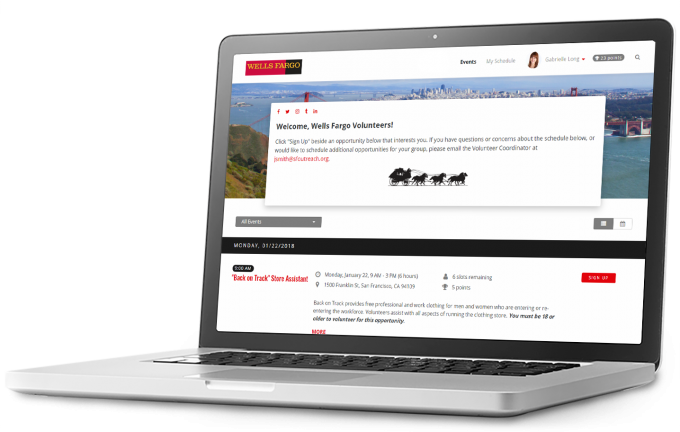 On these pages, they can easily view event details, requirements and more making volunteer registration a breeze. When a volunteer is ready to register for an event, they will create a username and password for your Hub. They can also use this information for future opportunities. Once they’re registered, VolunteerHub will send the volunteer a confirmation email with important event information to let them know they have successfully registered. Once the volunteer arrives at the event, they can check in quickly and easily via OnSite or Kiosk and get started right away. You can also send your volunteers a thank-you email after the event using automated emails. Avoid writing out individual emails to every volunteer without losing the personal touch to say, “Thank you” and encourage them to volunteer for your organization again. VolunteerHub makes it easy for volunteers to discover more opportunities and continue volunteering. Keep your calendar up to date, promote events on social media and use your volunteer database when you need to recruit. Plus, they can use the sign-in information they created previously to register for future events. Safely manage your data and information on our platform with VolunteerHub’s dual stage security. We utilize additional hard drives to maintain a real-time mirror of your info, and copy all information to a secure, offsite location each day to ensure that in the event of a hard drive crash or other occurrence, your information will remain protected. Once you begin using VolunteerHub, we won’t leave you hanging. Our support team will help you navigate the platform, set up your volunteer database and create initial events to take your first steps toward successful volunteer management.